Our Barney: Movie 3-Pack giveaway just ended. 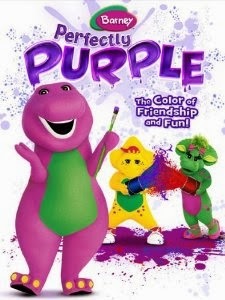 Now we have the next Barney DVD up for grabs, Barney: Perfectly Purple. The DVD is being released on November 12th from Lionsgate and HIT Entertainment. While Barney's Color Train Read-Alone fits the theme, matching sounds and the "Clean Up" song just aren't related. Does it hurt the value of the DVD? At just $15, not really as they're bonus features, not the core three episodes. And, if you like Barney, it isn't like you won't like them. The DVD itself makes a great Christmas gift / stocking stuffer. Enjoy. Our giveaway is open to US residents, 18+ and ends at 11:59 pm EST on 12/1/13.